A main component of the festival is our Student Jazz Workshop. Please make all payments to Delta Community Music School. Cash, cheque or bank e-transfers are accepted. Cash and cheque payments must be submitted to the music school office. 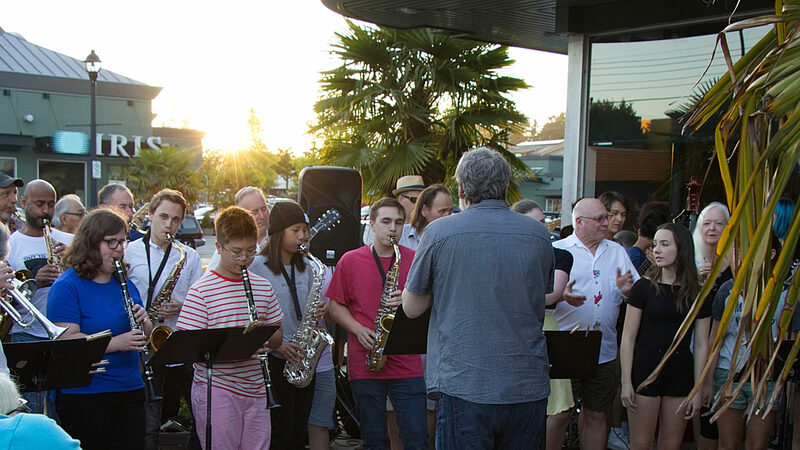 In order to pay by bank e-transfer, please send an email requesting instructions to the music school office at: office@DCMS.ca or call us at: 604.946.1280.
a one-week program designed to give musicians the opportunity to explore and deepen their knowledge of jazz improvisation and performance. An opportunity that allows musicians to focus on becoming better jazz players and performers. an exciting opportunity for music students to learn about jazz and improvisation from great musicians. All instruments (including voice) are welcome! Students will be placed in classes and an ensemble according to their ability and experience. Students will spend most of their time playing music in small groups and learning jazz repertoire and improvisation. Classes in jazz history and theory will also be available. Daily concerts and master classes with great guest artists will inspire, excite, and motivate. Workshop faculty are professional musicians from the Vancouver region and abroad who love teaching and are experienced educators. The students will have an opportunity to perform at a final outdoor concert and at an evening jam session in a local café. On the final day of the workshop, there will be a concert featuring the students. Registration is payable at the Delta Community Music School office. Please register early to assure placement as enrollment is limited. Scholarship and Bursaries are available on both merit and need basis. Students interested in scholarship support should apply as soon as possible. Scholarship funds are limited and disbursements will not be made until later in the summer. Students must be registered in and have paid full tuition in order to be considered for scholarship programs. To apply for a scholarship, please contact the school and indicate your interest in receiving financial support and indicate the reasons why you should be considered.